Virtually all passenger cars today have headrests as standard equipment. But decades ago, passenger cars did not have them. It was CarMate who led the industry by introducing headrests in 1965. And today, we are dedicated to provide automotive products of the highest quality at affordable prices and total customer satisfaction. 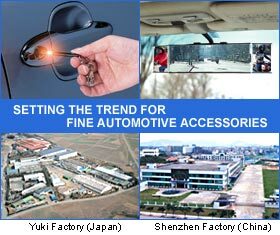 Since CarMate was established in 1965, we have expanded over the years to become the largest manufacturer of automotive accessories in Japan. On average we develop and introduce about 200 new items each year for the aftermarket. With more than 1000 precision designed and quality products currently available and export to over 30 countries, CarMate enjoys the reputation of being the industry leader and provider for all of your car lifestyle needs. The desire to create something brilliant. The desire to lead the industry...this is what we always strive for.